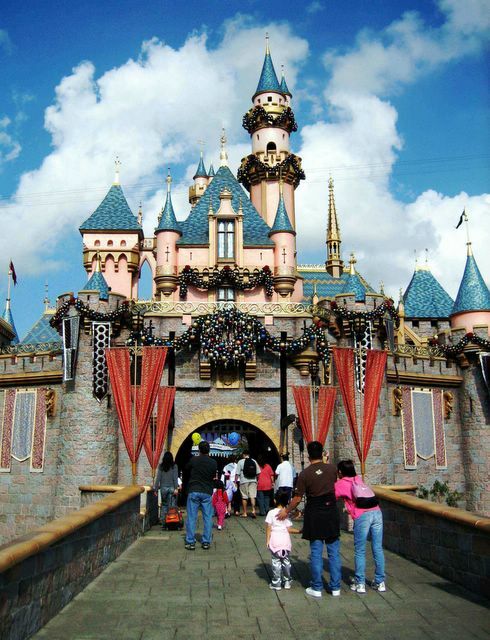 Inside the Happiest Place on Earth, there exists the "Smallest Place on Earth to Work": the Little Red Wagon at the end of Main Street, U.S.A.. There, in a parked truck, inside a compartment the size of a janitor's broom closet, two Disney Cast Members toil in what I imagine is the worst job at Disneyland. But the problem isn't just the cramped quarters; it's the sputtering deep fryer crammed in there with 'em. In August, when the mercury can easily climb past ninety in Anaheim, the closest thing to hell I can think of would be an eight-hour shift hunched over a smelly vat of boiling grease inside a sweltering sweat box made of metal. Whatever type of cooling or exhaust system they are provided can't be enough. All this in the name of cooking hundreds of hand-dipped wieners for tourists in floppy Goofy hats. 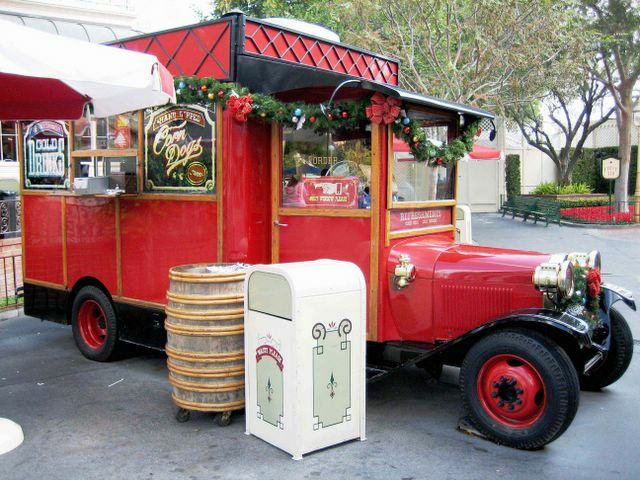 In the first two summers after high school, I passed by the Little Red Wagon every morning to walk to a relatively cushier job as a cashier in the Adventureland gift shops. And before I would spend my workday in an air-conditioned store, I used to say a little prayer for my comrades who were stuck with corn dog duty. Even today, as an Annual Passport holder, I still feel the prickly pangs of pity when I line up to order a corn dog, knowing that those sorry souls suffered to make my lunch. But despite it, the products of their labor is recognized by many as the best thing to eat in the park. In fact, it is my opinion that these corn dogs are probably the only decent meal to be had within the confines of the Magic Kingdom. But at $5.80 for a corn dog and a small bag of Lay's chips (and an additional $2.90 for a fountain drink), one pays a premium for the pleasure, just like all other things sold inside the resort. The corn dogs, however, are colossal, as long as my forearm and just as thick. Deep fried to a dark mahogany brown, it's as greasy as they come. A napkin I wrapped around its base for gripping turned clear on contact. Enough oil leeched out of its pores to lube up a bodybuilder, but the corn dog was scrumptious and filling enough to also feed one. A good and generous slathering of plain yellow mustard cuts through the richness of the juicy beef frank found at its core; but it's the fried and porous cornbread crust that I savor most. Thanks to the pull of gravity, almost all of the corn dogs produced are inherently lopsided, but it seems that the more asymmetrical the shell, the better the experience. Best of all is when the batter tears halfway through cooking, creating gnarled knobs of goodness reminiscent of crackly hush puppies. So, the next time you order a corn dog from the Little Red Wagon, do those working there a favor if they're looking down-and-out: tell them thanks. That would be the job from hell, though. I would worry that a disgruntled worker might do something to my corndog. Okay, I'm kidding...I think. Forearm-long hot dog? That sounds like a baseball bat to me. See you saturday Elmo (finally). haha. does your friend know that Quan Hy is central-vietnamese... meaning no pho. Now I don't feel so weird about having covered a churro cart. One of them gave me the evil eye as I was going to take a picture of them through a glass window at the back of the wagon. She was probably thinking, "Isn't enough that I'm in here. People shouldn't be taking pictures!" I got the hint and put my camera away. No pho! What the pho!? Hehehe!Just kidding. See ya Saturday! I, for one, liked that Churro cart review of yours! I just saw your CLUB 33 photos. Ohhh, I'm so envious right now. Green with envy! Ew! Okay, now that job is worse than the Corn Dog Truck. Perhaps even worse than the custodial jobs, where they have to clean up CODE-V's. (V=Vomit). Agree. We didn't like the food at the Blue Bayou, but loved the surroundings. And don't get me started on Yamabuki, a Japanese restaurant at the Paradise Pier Hotel. But, once upon a time, the Harbor Galley (the shack in front of the Haunted Mansion and on the river shore), served up fried catfish nuggets that I loved. It's part of history now. Also when I worked there, I also enjoyed the Monte Cristo sandwiches, deep fried sandwiches stuffed with cheese and ham. They were good, but the best part was that I got them at a discount in the employee cafeteria, located beneath the bowels of the Pirates of the Caribbean. I think they serve those grease bombs somewhere else in the park these days too. really well written. the way you described working at the park was enough to take me down memory lane with my days working at the plaza pavilion (now a part of ancient disneyland history). and the way you describe the little red wagon's corn dog. perfect. this post is at a jonathon gold level with the insider's scoop, the concrete descriptions and hilarious analogies. my two cents on the best food at disneyland is also a place that, unfortunately, no longer exists at the happiest place on earth - the tahitian terrace. google it, folks! i normally don't like polynesian food but this stuff was delicious and, in the confines of overpriced, underperforming disney eats, the happiest meal in the park. i used to work in the kitchen that shared prep space with the tahitian terrace and got to sample most of the food. i was also a guest twice at the restaurant. it was a dinner show restaurant. it was basically like being at a luau. i was picked by one of the hula girls to go on stage and then backstage to put on my own hula outfit. she then gave me a 30 second hula lesson. suddenly i found myself behind a waterfall (the back side of water. ooh! ahh!). the waterfall then opened up like a liquid curtain. there i was facing the full house of diners. i hula'd the best i could, coconut bra and all. i miss it so. p.s. 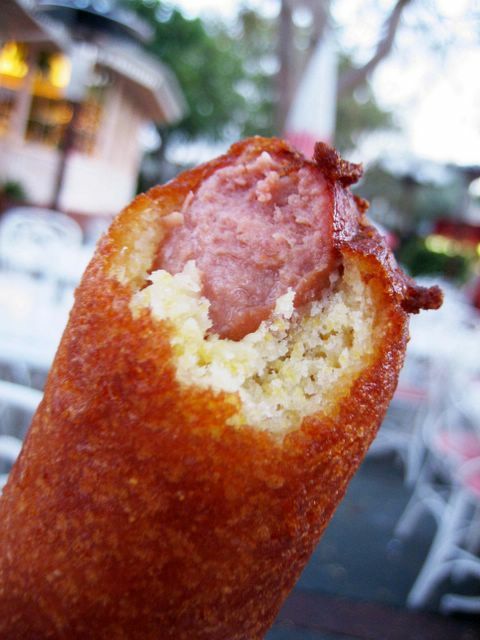 try the spicy corn dog over at cal adventure. in my opinion, a better corn dog. Wow, J. Gold?! Thanks for the compliment! And thanks for sharing that wonderful story! Unfortunately, by the time I worked there, they were already in the midst of turning The Tahitian Terrace into Aladdin's Oasis, which seemed like a good idea at the time. Now, the space seems to be wasted on the Aladdin and Jasmine's Storytelling Show, which is redundant because of DCA's Aladdin show. I'm sorry to have never experienced Tahitian Terrace when it was still around. But during that time, since it took a small fortune from my parent's salary just to take us to Disneyland, dining at the Tahitian Terrace was a "one of these days" kind of place. Too bad it went away before that day came around. As a cast member at the park, I have to agree that the ol' corn dogs from the Little Red Wagon are soome of the best food fare in the Kingdom! Aha! So that's where I can find the Monte Cristo Sandwich. Now that you mention Cafe Orleans' Seafood Crepe, I think you might have me as a customer soon. I love crepes as much as I love seafood. Both together?! Well, now we're talkin'! I'll be sure to tip well too! Check out these photos that another food blogger took. Look at how obscene that is! I'm beginning to think that if there's anything that Disneyland does well at when it comes to food, it's stuff that's deep fried. Whodathunk? I feel your pain. I usually eat before I go into the park (Zankou Chicken is mere blocks away! ), but when I have to eat inside, I head straight for the corndog truck and bypass all the burger stands. That one in Tomorrowland seems like a tourist feeding trough! I too love the corndogs at DL. Be sure to try the Fried Chicken at The French Market (next to Cafe Orleans). Too bad they don't come with mashed potatoes and brown gravy like they did when I was a kid. Isn't Zankou's the best? I've never even been there! My friend picks it up for me when I visit her. Good friend huh? Love your posts! late comment i know but i wanted to say that i LOVE the corndogs as well. I typically will grab a glass of wine and then drink and walk my way to that corndog castle or whatever its called. as for food at dland, i also very much enjoy the ribs and chicken at the riverbelle terrace. They also had a fabulous chocolate fudge cake there a few months back that was recently replaced by a chocolate mouse cake(which i dont like as much). It seems that if it's deep fried in Disneyland, you can't go wrong eating it. Case in point: Monte Cristo, corndogs, and now, as you have recommended, the fried chicken. I actually sorta like the Chinese chicken salad at Rocket Redd's Pizza Port in Tomorrowland. It's supposed to be the "salad of the day" or something, but everytime I go, it's Chinese chicken salad day. Whenever we at our house have a corndog anywhere else, we ALWAYS say, "but it's not as good as Disneyland"!!! OH YEAH, baby. Those luscious babies are thheeeeee best! Thanks for the write up and photos! We're going there for T'giving. Maybe we should bring a special giftee for the corndog makers!